YOU Continue to do Amazing Things! 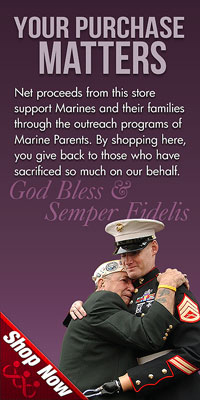 In 2007, MarineParents.com launched its Gold Star Luminary Initiative, and annual luminary-lighting ceremony that takes place at dusk on Gold Star Mother's Day (the last Sunday in September) in communities around the country. Our first piece looks at this year's event in Columbia, Missouri (home of the MarineParents.com corporate office). Two weeks ago we alerted you to a Marine family in San Diego with a critically ill daughter and asked for donations to help ease the family's financial burden. As always, you far surpassed our expectations. Two days ago, your extreme generosity was once again on display, as you came together in a way we've never experienced before, shattering our previous record for donations received in a single day as money came in to support Gold Star families who were, at the time, being denied "death gratuities" due to the government shutdown. 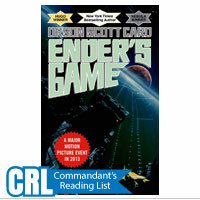 You can read more about it in our second piece. 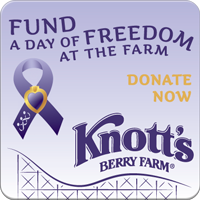 Since 2009, our Purple Heart Hero Support program has taken Wounded Heroes on an annual outing to the Knott's Berry Farm amusement park in Buena Park, California. 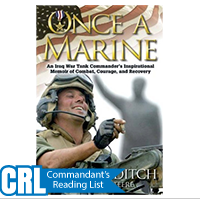 Read more about this year's activities, as well as how you can help brighten the day of some brave Marines, in our third piece. 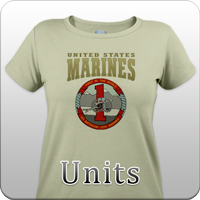 October is here and that means this year's Marine Corps Marathon is right around the corner. 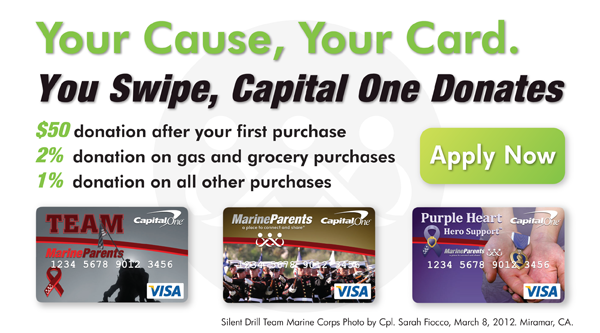 Read about the booth that MarineParents.com will have at this year's marathon as an official corporate sponsor in our fourth piece. 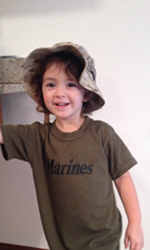 Finally, we take a look at this issue's Team Marine Parents Featured Participant. This issue's Featured Participant is the niece of multiple active-duty Marines, will be running in support of Purple Heart Hero Support, and is our youngest ever team member--Mackenzie Murphy from St. Louis, MO. In 2007, MarineParents.com launched its Gold Star Luminary Initiative as a way to raise awareness of Gold Star Family Day, as well as to honor and support Gold Star families, by holding luminary events throughout the country. Beginning in 2011, the organization has been holding an annual event in Columbia, MO, home of its corporate office, to commemorate the day, and this years was, by far, the most successful yet. "I was somehow made aware of Gold Star Mothers Day," said Della Vecchia when asked to explain how the event came to be, "but couldn't find anything about how it was recognized; there were not flags at half-staff, nothing that people did in recognition. 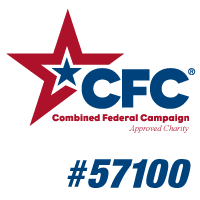 To be an 'awareness' day and yet have nothing to 'act on' creates failed awareness in my opinion," and, with that in mind, Marine Parents' Gold Star Luminary Initiative was founded. This year, thanks to the efforts of volunteers and military supporters, tens of thousands of people in hundreds, if not thousands, of communities around the country came together on the evening of September 29, 2013 to hold ceremonies and light luminaries at dusk to pay tribute to America's Fallen Heroes and their families. This past Tuesday, October 8, 2013 we asked you to help us raise money for the family of a Marine who died in Afghanistan last Saturday, October 5. At the time, military families were being denied "death gratuities," a $100,000 payment, guaranteed in every service member's contract, that family members use to ease the burden of funeral costs and travel fess to meet and transport the body. Our goal was to raise $10,000 for the family of Lance Corporal Jeremiah Collins, 19, of Milwaukee, Wisconsin. Your response was overwhelming and more than we ever could have imagined. Thanks to your extreme generosity, we raised $10,000 in the first hour and almost $41,000 total (in just 30 hours). This is truly amazing, as well as a new donation record (both in terms of the total amount of money received as well as the speed in which the donations poured in). Due to the amazing amount of support from you, the Marine Parents family, not only were we able to provide $10,000 for the Collins family, we will also be able to provide $10,000 to the family of U.S. Army Sergeant Joseph Peters, 24, of Springfield, Missouri, who died in Afghanistan last Sunday, October 6. Fisher House, a charitable foundation best known for building comfort homes near military medical centers to allow the families of wounded, ill, and injured service members to be near their loved one during recovery, has stepped in and will be paying death gratuities to Gold Star families while the Federal Government is shut down. As a result, the remaining $20,000 from our recent fundraising initiative will be used to provide additional support and emergency assistance as/when other issues arise due to the shutdown, as we feel it's important to have a reserve for critical needs at this time. On the evening of Wednesday, September 25, we launched a fundraising campaign hoping to collect $5,000 for a Marine family in San Diego whose 4-year old daughter is critically ill in hospice care. Due to Tri-Care denying the family's claims, their medical expenses were rapidly mounting and we wanted to help ease that burden. As usual, the MarineParents.com family met and exceeded all expectations. You all came together and raised over $9,000 in just 3 hours. The support and generosity you all have displayed is beyond anything we could have imagined. We truly thank you, as does a very grateful Marine family. Once again, you guys have show that Marine families truly do take care of their own. Semper Fi. and active-duty personnel (plus one additional guest) as part of their military appreciation program, but PHHS would like to raise an additional $7,500 to cover other costs, as this will be our biggest outing yet. These costs include the rental of four 55-passenger wheelchair-accessible buses, parking fees, additional tickets for Marines who have more than one child coming with them, and the Marines' breakfasts, snacks and drinks during the day, and group dinner in the evening. Roughly 300 Marines and family members are expected to attend this year, including special guests Colonel Willard A. Buhl, commanding officer of the Wounded Warrior Regiment and Sergeant Major Michael T. Mack, Sergeant Major of the Wounded Warrior Regiment. Meet Us In D.C. at Booth #129! As many of you may know, this year's Marine Corps Marathon is coming up in just a few short weeks, taking place on Sunday, October 27. This year marks the 38th annual running of "The People's Marathon" as well as the first time that we, Marine Parents, are an official charity partner. This month's TMP featured participant is the first youth team member in TMP history--Mackenzie Murphy. Mackenzie, who turns three in January, is the daughter of Ryan and granddaughter of Mike, two TMP members who competed in the MCM Historic Half in Fredericksburg, VA, back in May. Mackenzie also currently has an aunt and uncle who are both active-duty Marines. Mackenzie will be participating in the St Louis Police Athletic League Bobby Ceriotti Memorial Glow Run this Friday, October 11, in St. Louis, Missouri. She has currently raised $85 of her $200 goal, but with your generous donations we know she can meet and exceed her goal in no time!